Derived from the AHRC funded research project ‘REWINDItalia’, REWINDItalia Early Video Art in Italy/I primi anni della videoarte in Italia – edited by Laura Leuzzi and Stephen Partridge – aims to bring the seminal Italian early video experimentation back under the International spotlight. The volume includes seminal essays, already appeared in Italian publications, plus newly commissioned texts by leading scholars and artists, translated into English for the first time. A wide selection of stills from video artworks and photographs from set provide a fruitful resource for research and study. Authors include: Renato Barilli, Maria Gloria Bicocchi, Lola Bonora, Silvia Bordini, Paolo Cardazzo, Cinzia Cremona, Sean Cubitt, Bruno Di Marino, Simonetta Fadda, Vittorio Fagone, Marco Maria Gazzano, Luciano Giaccari, Mirco Infanti, Laura Leuzzi, Sandra Lischi, Adam Lockhart, Stephen Partridge, Cosetta G. Saba, Emile Shemilt, Studio Azzurro, Valentina Valentini, Grahame Weinbren. 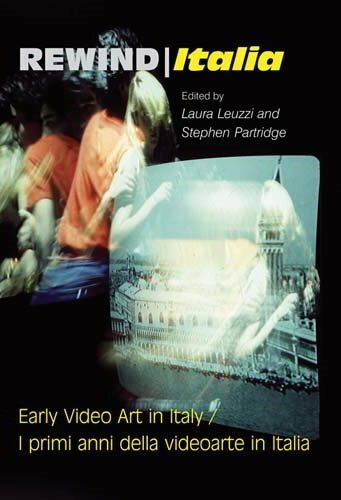 The volume is closed by The Chronology of Video Art in Italy (1952–1992), by Valentino Catricalà and Laura Leuzzi, translated for the first time into English. With a foreword from Don Foresta, and an introduction by Stephen Partridge. Translation by Simona Manca. Laura Leuzzi is an art historian and curator whose research focuses on the relationship between words and image in visual art and new media. She was a research fellow on the Arts and Humanities Research Council funded project, REWINDitalia, based out of Duncan of Jordanstone College of Art and Design, University of Dundee. Stephen Partridge is an artist, academic researcher, and pioneer of Early British video art. He is Professor of Media Art at the University of Dundee and co-editor (with Sean Cubitt) of Rewind: British Artists' Video in the 1970s & 1980s.